Herbert's evocative, epic tales are set on the desert planet Arrakis, the focus for a complex political and military struggle with galaxy-wide repercussions. Arrakis is the source of spice, a mind-enhancing drug which makes interstellar travel possible; it is the most valuable substance in the galaxy. When Duke Atreides and his family take up court there, they fall into a trap set by the Duke's bitter rival, Baron Harkonnen. The Duke is poisoned, but his wife and her son Paul escape to the vast and arid deserts of Arrakis, which have given the planet its nickname of Dune. Paul and his mother join the Fremen, the Arrakis natives, who have learnt to live in this harsh and complex ecosystem. But learning to survive is not enough - Paul's destiny was mapped out long ago and his mother is committed to seeing it fulfilled. Frank Herbert (1920-86) was born in Tacoma, Washington and worked as a reporter and later editor of a number of West Coast newspapers before becoming a full-time writer. His first sf story was published in 1952 but he achieved fame more than ten years later with the publication in Analog of ?Dune World? 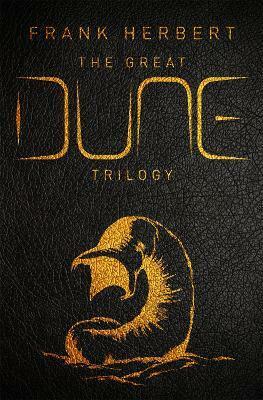 and ?The Prophet of Dune?, amalgamated into the Hugo and Nebula-winning novel DUNE in 1965.